Hello and welcome to the 198th instalment of the SWD. 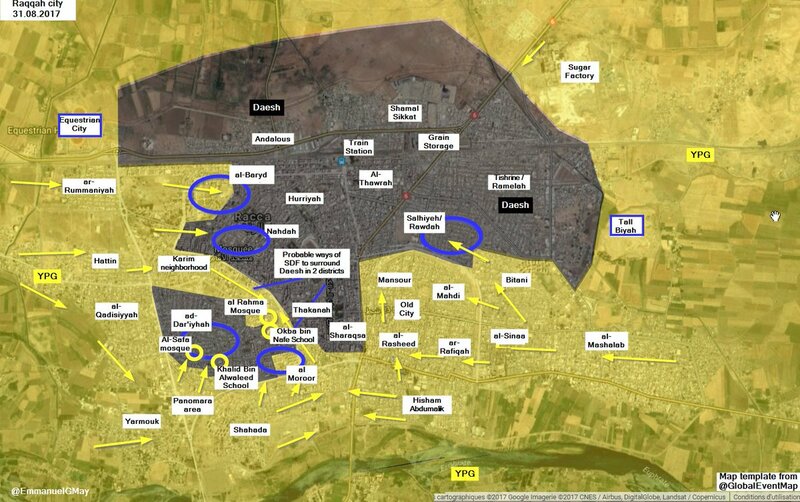 The Syrian Democratic Forces made significant progress in Raqqa city after clashing with ISIS terrorists. The US-backed forces captured Al-Safa mosque, in Alwaleed School in Dar’iyhah district, Al Rahma Mosque, and O. bin Nafe School in Moroor neighbourhood. This last advances created a second ISIS pocket in the area of Raqqa city. Although, it is important to consider that, probably, ISIS has a large tunnel system within the city which communicates the forces in each pocket. 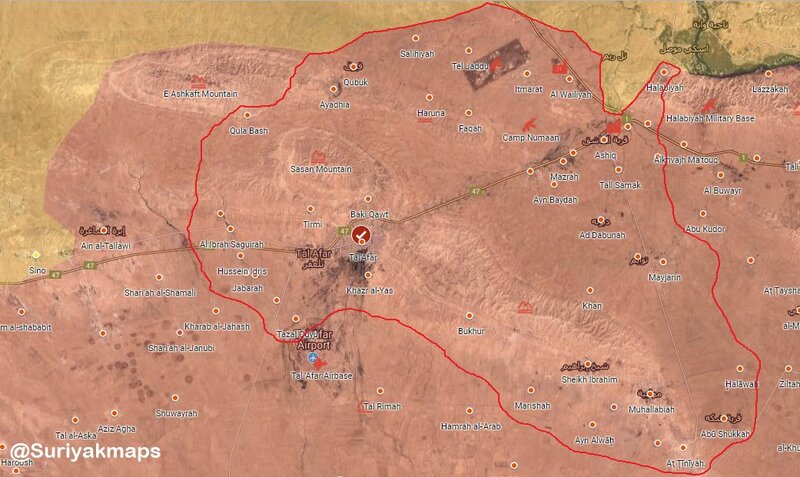 ISIS forces are now trapped in the large pocket which includes most of the northern urban area of the city, and the small pocket which is Darayeh district. The Islamic State’s media member “Abo Al-Khair Al-Shami” died during clashes between ISIS and SDF. Additionally, IS forces launched an attack on government forces in Badia Ghanem Al-Ali in Raqqa countryside with unknown results. On the SAA side, more than 50 soldiers reached SAA checkpoints and positions after the contact was lost during the multiple ISIS attacks on government position south of Raqqa governorate. The SAA elite unit “Tiger Forces” attacked ISIS from its positions in the Raqqa-Homs governorates border. This attack successfully captured Jabal Bishri, a strategic mount on the way to Deir ez-Zor city. Casualties were reported after Turkish-backed forces shelled Afrin city in north Aleppo governorate. Up to 15 groups, most of them based in the Euphrates Shield territory, support the formation of a Unified National Army in Syria, including Ahrar Al-Sham. Government artillery shelled Al-Tamanahah town with unknown casualties. 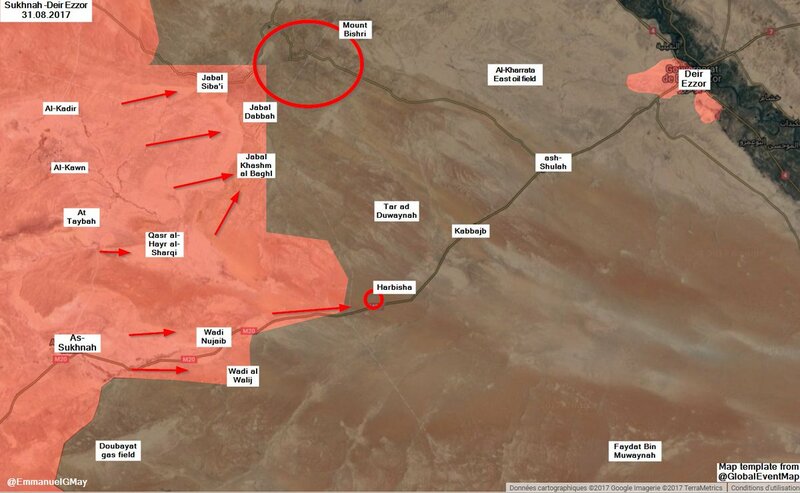 The Syrian Arab Army and its allies took control of Al-Musharifat, Al-Hafia, and Al-Zaghrutia villages on the Huwaysis axis. Additionally, they captured Maksar Shamali, Maksar Janoubi, Qastal Shamali, and Qastal Wastani. The area is slowly being captured from the besieged ISIS forces in the Hama-Homs pocket. Some reports and sources suggest that SAA created a large pocket in the north east area of Uqayribat after capturing some strategic points. According to an ISIS-uploaded photo, two Russian soldiers were killed by ISIS militants somewhere in east Hama. The SAA and allies captured Harbisha, which is situated on the road that leads to Deir ez-Zor. Additionally, several convoys were spotted transporting reinforcement and armoured vehicles to the front lines, including some vehicles usually used in urban warfare. The Islamic State handed over to Hezbollah the body of the Iranian soldier they executed in southeast Syria some days ago. 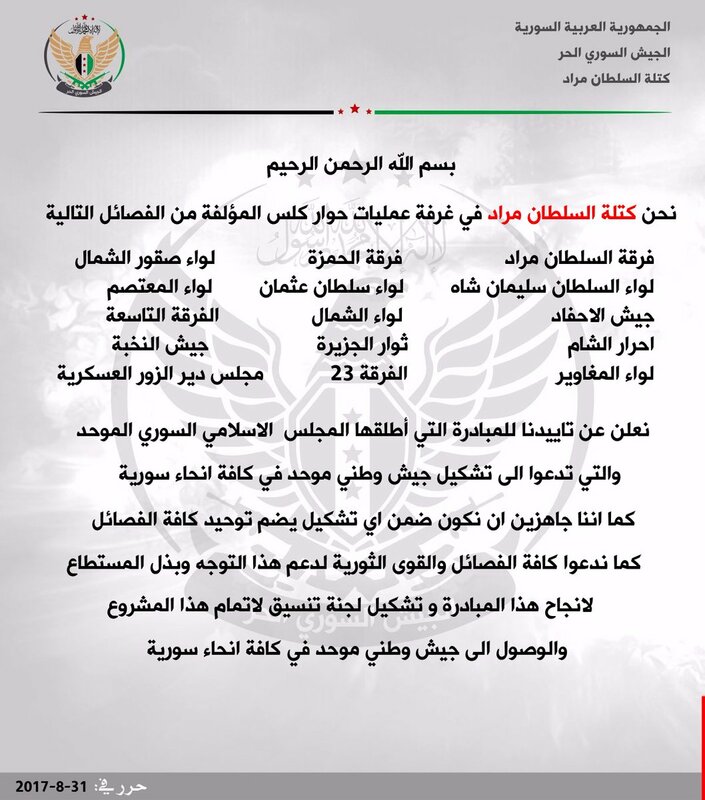 The FSA groups “Al-Abdo Martyrs” and the “Army of Eastern Lions” announced both groups merged and refuse Jordan’s demands to hand the Syrian Badia to government forces. Jordanian authorities previously warned that all groups refusing to leave the Al-Tanf area would have they support cut off. As a response, SAA renewed the attacks against FSA in southeast areas after some of the FSA groups rejected the Jordanian request to stop fighting. Government forces targeted the city of Douma in East Ghouta pocket with several Volcano rockets with unknown damage and/or destruction. FSA freed the Syrian pilot “Ali Al-Helo” who was shot down two weeks ago, and 30 SAA soldiers in southeast Syria. 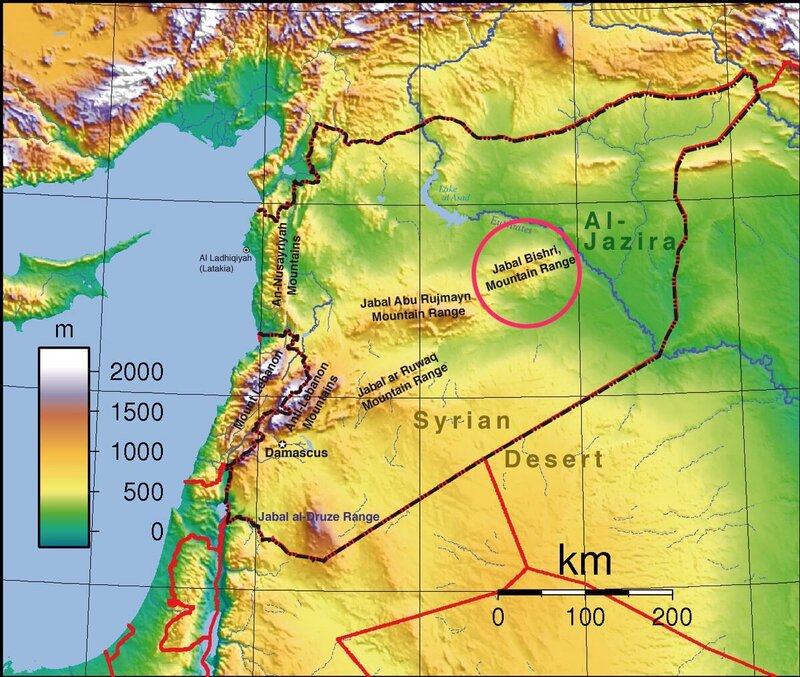 The reason could be the warning made by Jordan to hand-over the whole FSA-held area in the Syrian-Jordan border to Syrian government forces. After recent SAA advances, government forces are just 37 km from lifting the siege of the government-held city of Deir ez-Zor, which has been under full ISIS siege for over 4 years. The last area captured by government forces, Mount Bishri, is the last mountain before the great Euphrates plains. The Iraqi forces have completely captured Tal Afar pocket from ISIS forces, which cleared most of the northern area of Nineveh governorate in Iraq. There are more than 1.600 ISIS members (including familiars and relatives) which cannot be protected according to Iraqi forces, as they are widely hated by the local population. The possible new objective is Hawija city. On the 30th of August 2017, CJTF-OIR has conducted 21 strikes in Syria. CJTF-OIR‘s main focus in Syria is Raqqa region where they did 17 strikes supporting SDF‘s operations against IS destroying 15 fighting positions, two command and control nodes, a logistics node, and an IED factory. Other areas where four strikes occurred are Abu Kamal and Al Hawl destroying eight ISIS oil stills and an ISIS tactical units; damaged five supply routes. The full report on CJTF-OIR strikes conducted in both Syria & Iraq can be found here.